All in one system with custom hardware designed specifically for POS software that helps you run your business better, and a merchant account that offers some of the best rates in the business. Clover Mini- Most advanced 7” Antimicrobial Corning ® Gorilla® Glass display screen payment terminal on the market. Accepts payment types including: Apple Pay, EMV, credit, debit, and EBT card swipes, and gift cards (physical or virtual). It can also be used through Wi-Fi or wireless connectivity. Clover Flex Solution– Clover Flex is the all-in-one device with the built-in capabilities to help you serve customers better—whether at the counter, in line, at the table or in the salon chair. 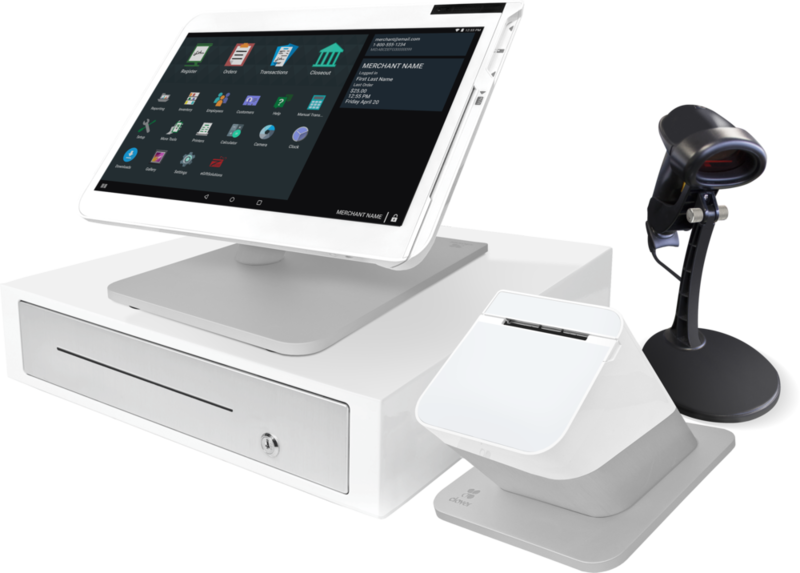 Because it’s a wireless point-of-sale device with Wi-Fi and LTE connectivity, Clover Flex lets you do business right where you stand.Take orders, scan and manage inventory, accept payments and print, email or text receipts. It’s all included in the sleek and durable Clover Flex. Clover Station– The all-in-one POS system that comes with a cash drawer and receipt printer. No extra costs. No hidden fees. Optional accessories allow you to further customize your station. It can be used through Ethernet, wireless, and Bluetooth options for optional connectivity. PinPoint Rewards– Universal savings and reward program, offering members discounts and rewards at a wide variety of merchants through a single card- a PinPoint card. Abreeze Link for MailChimp– This Automatically sends transaction and customer information from your clover POS to your MailChimp lists. This allows for email marketing automation and rich segmentation by items purchased, categories purchased, amount spent, and much more. This will bring your existing customers back for more! Cloe-Mobile Ordering – A mobile ordering experience is fast becoming expected by customers. Cloe gives you an easy and inexpensive solution with costing time. It automatically uses your clover inventory to create a menu. Contact us today if you would like to talk about us building a Clover solution for your business.